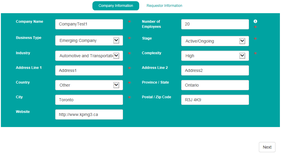 In 3 easy steps, we will provide you with a free diagnostic and help you to assess the capabilities of your business across 6 key areas. 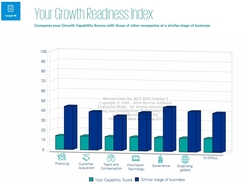 To gain further insight into the capabilities needed to support your company’s growth plans, we also developed the Growth Readiness Index to compare your capabilities to those at a similar stage in their business. Register online to gain access to the KPMG Enterprise Growth Readiness Index assessment. There are 8 steps to the assessment. All questions are required and must be completed before moving onto the next step. This information will help us determine what kind of questions to ask. The survey should take no longer than 30 minutes to complete. 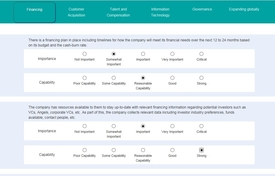 Within seconds, your customized report will be ready, containing 3 key insights on your business' growth readiness capabilities and how it compares to those at a similar stage in their business. All companies have a business cycle - from a startup to a mature company - and each stage presents its own set of opportunities and challenges. KPMG Enterprise advisers understand what it takes for you to be successful at each stage of your business journey. Now is the time to turn your entrepreneurial ideas into a business reality. Let KPMG Enterprise help with the heavy lifting, from establishing your operations and raising capital, to international expansion, and complying with regulatory requirements. Whether you’re looking to grow organically, through M&A, locally, or by global expansion, discover how to break through to the next level. Our skilled advisers can assess your growth capabilities and help you identify avenues that make sense for your business. In today’s fast paced economy, it’s all about driving peak performance. KPMG Enterprise advisers are dedicated to helping you lower your risks, strengthen your operations, and create an effective plan of action. We know what it takes to win – and are committed to helping you get there.